Today is is Earth Day. Typically, I don’t like to re-post many of my newsletters. But I’m intensely passionate about living a greener life and helping others to do so as well. For over 40 years, Earth Day has inspired individuals and organizations all over the world to demonstrate their commitment to environmental protection and sustainability. Please consider participating in a Billion Acts of Green by taking part in the largest environmental service project on the planet. about Science in America in honor of March for Science today. Today is Earth Day and it’s an opportunity take a moment to ask ourselves “what am I doing to protect our planet?” There are many easy and simple ways to be eco- and earth-friendly. Look through the list below and see if you can incorporate some of the suggestions your daily life. 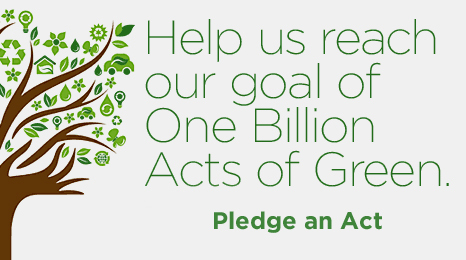 an initiative to get one billion people to publicly pledge to commit green and eco-friendly acts like the ones suggested below–or create your own! Use printing paper on both sides. Before you buy containers for storage, “shop” around your house to re-purpose large vases, colorful boxes, shopping bags, greeting card boxes, drinking glasses, mugs, etc. as containers to “corral” items. Eliminate or minimize single-use products, eg: disposable razors, paper plates, plastic water bottles, etc. (Re)Use a travel mug for your coffee and water bottle for you water..
Use Craigslist or Local Yard sales on Facebook to give away your unwanted stuff to other people to use. Donate clothing, eyeglasses, household items to charities. Shop at flea markets, consignment and thrift stores to re-purpose other peoples’ stuff. Send e-cards instead of paper ones when appropriate. Use your bike (now’s the perfect time to get one) to do your local errands. Bring a backpack or attach a basket to your bike to carry personal items. Turn off your lights and appliances when not needed. Shop “local” whenever possible. In other words, buy products that are made or produced locally, not from across the country or across the world. Shop at Farmers’ Markets, which offers locally grown produce. Teach your children how to grow veggies and herbs. Eat locally by supporting local farms by joining Community Supported Agriculture. Turn computers and monitors off or to sleep mode. Wash clothes and linens in cold water and do only full loads. Use ceiling fans whenever possible. 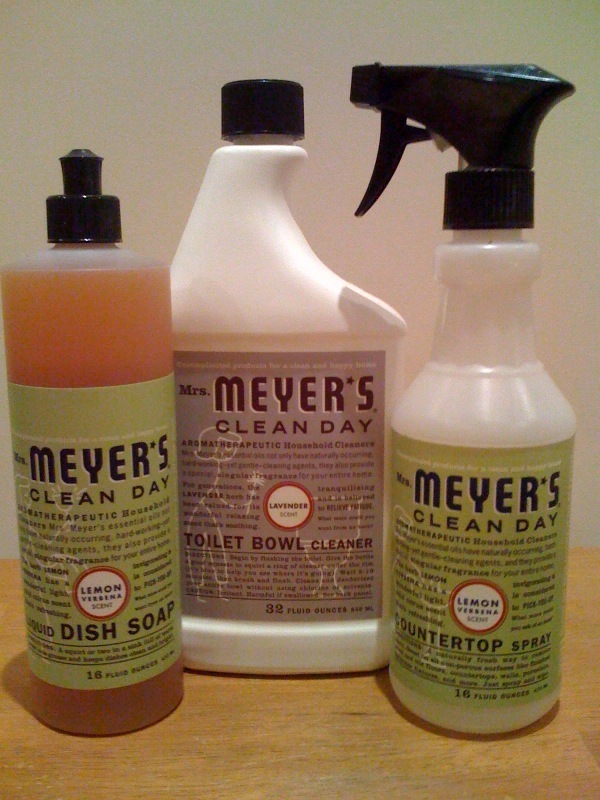 Use natural cleaning products–like Mrs. Myers Clean Day All Purpose Cleaner, BioKleen Laundry Detergent and Bon Ami scouring powder–without heavy toxic chemicals, so as to not pollute our waterways. Check out our favs here. Buy organic food and other products without chemicals when possible. Check out GoodGuide.com which rates products on their health, environmental and social performance. Eliminate toxic lawn additives, pesticides, bleach, air fresheners and use natural alternatives. Before you throw it out, ask yourself “can this or part of this be recycled?” Set up a nice looking, user-friendly recycling pail and/or basket in your kitchen or mudroom so everyone is encouraged to recycle everything possible. (Almost all packaging is recyclable these days.) Then bring recycables to your larger recycling station where your trash is kept. Aim to have minimum trash, maximum recyclables. Sell your electronic gadgets at gazelle.com. and reduce e-waste. Recycle batteries at Battery Solutions. Initiate a neighborhood cleanup of your local park, beach or street; celebrate with a block party. Bring silverware and a travel mug to work to cut down on paper. Compost your kitchen scraps. 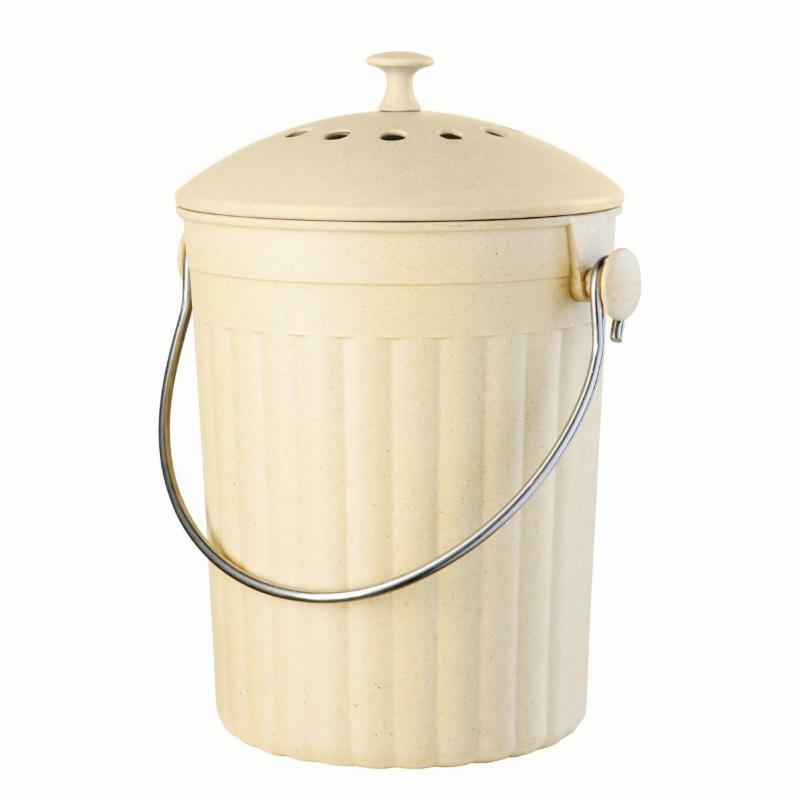 There are some really nice looking countertop composting bins these days. Then bring the scraps outside to your compost heap. Use cloth towels and napkins instead of paper ones when appropriate. Install a shower head that uses less water and filters out harsh chlorine. Create an account with Catalog Choice and DMAChoice.org to pare down your junk mail by removing yourself from catalog lists. Use rain barrels to catch rain water to water your garden. Run the dishwasher only when full; limit the drying cycle and let dishes air dry. Bring your own bags everywhere not just to the supermarket. Invest in an e-reader like the Kindle or iPad to save trees.